Aten - CS64A 4-Port PS/2 KVM Switch with Attached Cables, CS64A KVM Switch has a handy design integrating with 6 feet of cables. 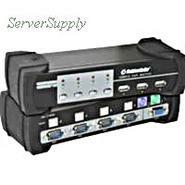 It can control 4 servers via a single console. Cables To Go - 35555 CABLESTG - 4 PORT VGA USB 2.0 AND PS2 KVM SWITCH WITH CABLES CONNECTS FOUR COMPUTERS TO ONE USB OR PS2 KEYBOARD AND MOUSE AND ONE VGA MONITOR (35555). NEW. IN STOCK. SHIP SAME DAY.